June’s Object of the Month is special to us here at Shaw’s Corner for three reasons: firstly, and most simply it is a beautiful, clever picture. 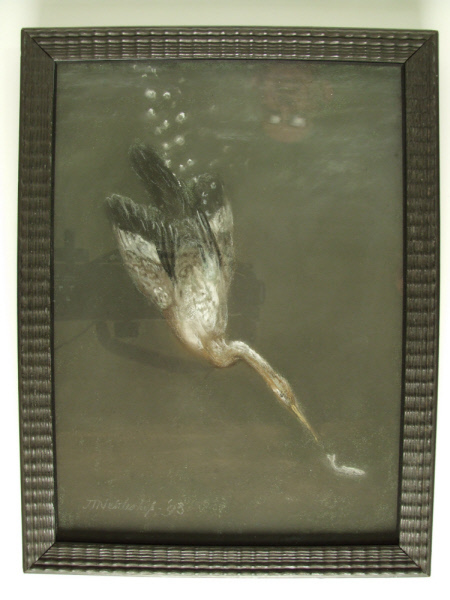 John Nettleship was one of the great animal artists of the nineteenth century, and this diving heron with a trail of bubbles in its wake is no exception. Secondly, it reminds us of Shaw’s great love of birds and the huge variety of birds that live in and around the gardens here at Shaw’s Corner – we frequently see the local heron on the way too and from work. But it is the third reason that is the most interesting. This small and simple picture represents a complex network of artists, writers and actors that Shaw was at the very heart of and flows throughout the house here at Shaw’s Corner. John Nettleship was married to Adaline Cort, better known as Ada Nettleship. 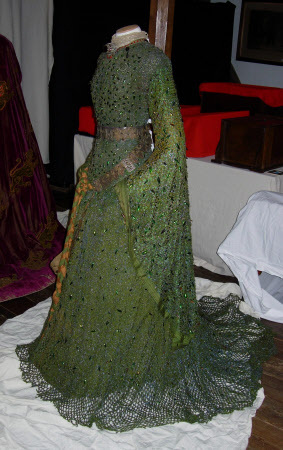 It was the ‘divine Ada’ who made in crochet the famous beetle wing dress worn by the actress Ellen Terry to play Lady Macbeth. The dress is now at our fellow National Trust property Smallhythe Place, Ellen’s beautiful home in Kent. Shaw and Ellen Terry had a long and very close relationship despite only meeting a few times. Theirs was a ‘paper courtship’ that lasted decades. 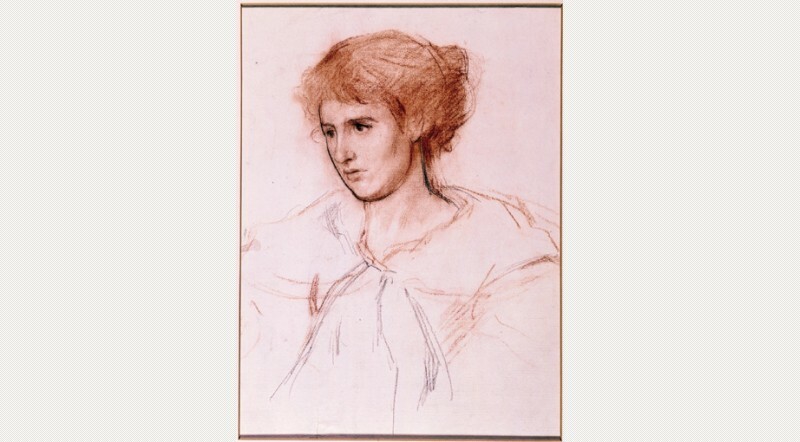 John and Ada Nettleship had several children, and their eldest daugher Ida followed in her father’s footsteps and attended the Slade school of art, where she met Augustus John. The couple married and their son Caspar John went on to become British First Sea Lord. John’s sister Gwen was also a passionate and talented artist. You can find out more about the complicated relationship between Gwen, Ida, Augustus and his mistress Doreila in this article by Michael Holroyd (who has also written biographies of Shaw and Ellen Terry). So this Diving Heron in the Entrance Hall is already linked to last month’s Object of the Month, the portrait of Shaw by Augustus John, but the connections go a step further. Gwen John became sculptor Auguste Rodin’s mistress in 1904, the start of an affair that would last ten years and was at its height in 1906, when Shaw went to the Villa Meudin outside Paris to sit for the bronze bust that is now in the Drawing Room here at Shaw’s Corner. Many people came to visit Shaw and Rodin during the sitting – one of whom was Augustus John’s great friend William Rothenstein, whose unfinished portrait of Shaw now hangs in the Museum Room here! 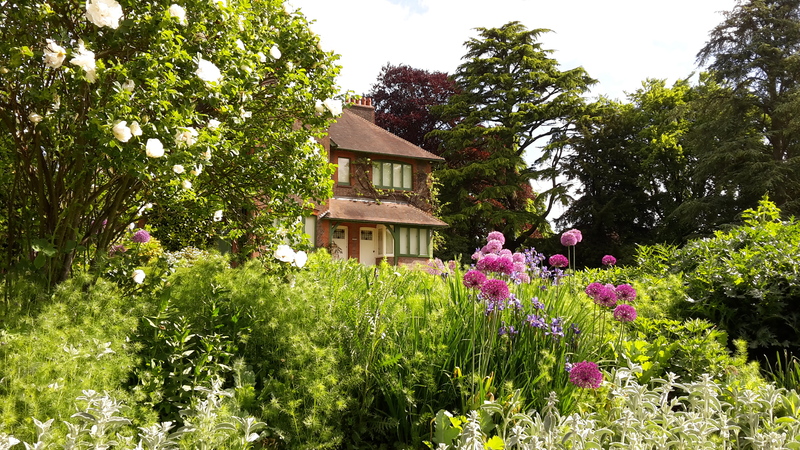 June is always one of our favourite months here at Shaw’s Corner – the garden looks absolutely stunning, the weather is good and there are some fantastic events. June 2015 is no exception to this! June at Shaw’s Corner is always glorious. On Sunday 7th June the garden is open as part of the National Garden Scheme, with the Ionian Singers performing under the trees. We’ve also got a wide range of plants for sale, a great selection of second-hand books to browse through and our volunteers will have been making some delicious cakes. It should be a lovely relaxing day for all our visitors. 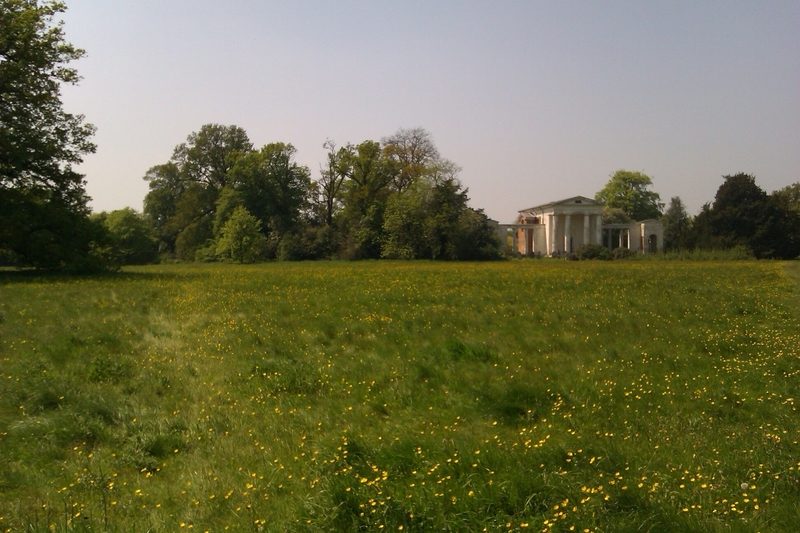 The beautiful Palladian Church is just down the lane from Shaw’s Corner. Its also a great weekend to visit Ayot St Lawrence, with two other gardens open for the NGS, the Ayot St Lawrence Art Show, and a Beer Festival at the Brocket Arms! There’ll be parking in the village field, so why not come out and make a day of it? On Sunday 14th June we join in the national celebrations for the 800th anniversary of the signing of the Magna Carta with our Liberteas event- raise a cup to celebrate our individual freedom and human rights! Here at Shaw’s we are celebrating in particular Shavian style with a performance of Shaw’s brilliantly witty and very pertinent play On The Rocks – which sees an isolated and out of touch Prime Minister plan his country’s future whilst the unemployed riot in Trafalgar Square. It’s funny too! And we save the best to last! To finish off the month, we have the first of our two annual Outdoor Theatre productions: Mrs Warren’s Profession, one of Shaw’s best plays, on 26th, 27th, 28th June. With a fantastic cast and the hilarious writing of Shaw, do not miss the opportunity to watch this play in the writer’s very own garden! 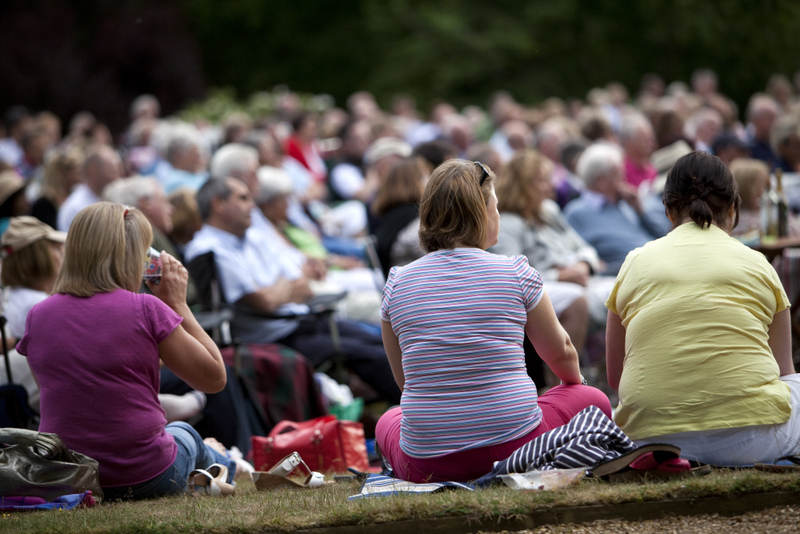 Audience watching the performance at an outdoor theatre event at Shaw’s Corner, Hertfordshire. May’s object of the month is the portrait of Shaw by Augustus John that now hangs in the Dining Room here at Shaw’s Corner. Shaw sat for it in May 1915, and was not content with being a passive sitter. The passionate photographer turned the lens on the artist and the photos below are just some of the results. You can see our Augustus John portrait and more of his work on the BBC Your Paintings website. All of these pictures, and many more taken by George Bernard Shaw can be found at the London School of Economics archives. Can there be anything more perfect than relaxing in a beautiful garden, a glass of something tempting in your hand on a lovely summer evening as you watch a play that sparkles with wit? Especially if that garden was the very place where that masterpiece was written? Audience at an outdoor theatre event at Shaw’s Corner, Hertfordshire. 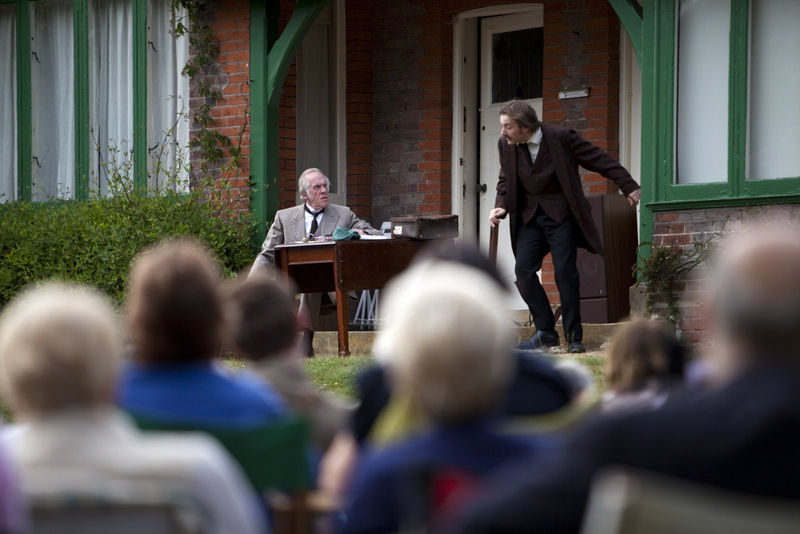 Here at Shaw’s Corner, we’re lucky enough to enjoy this perfection every year, as we host outdoor theatre productions of George Bernard Shaw’s inspiring, influential, thought provoking and hilarious plays. But what do we do when it rains? Of course, not every summer evening is bathed in sunshine. So what do we do when it rains? The show must go on of course! 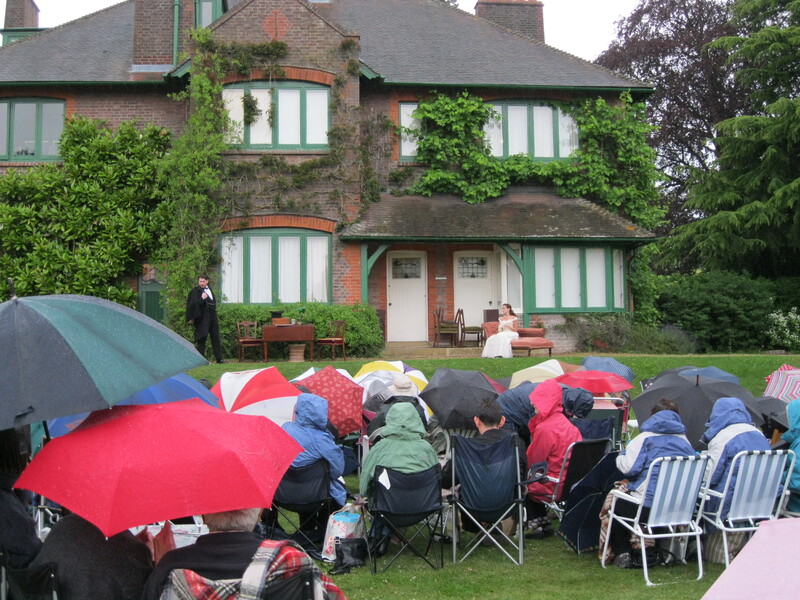 The umbrellas go up, for cast and audience alike – the weather might not be perfect, but the words still are! Playgoers are welcome to swap their tickets and come on a drier night, if they would prefer. Audience at an outdoor theatre event with the house in the background at Shaw’s Corner, Hertfordshire. 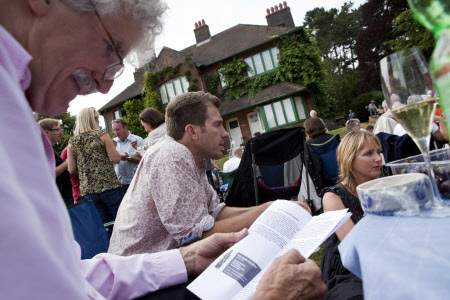 Our annual plays are a continuation of a long tradition that first began with members of the UK Shaw Society meeting in the garden here at Shaw’s Corner on Bernard Shaw’s birthday to celebrate his life and works. From these small beginnings, the plays have grown, as we welcome hundreds of enthusiastic playgoers, all armed with fabulous picnics. You can find more about the history of the plays at Shaw’s Corner in this fascinating article by leading Shaw scholar Richard Dietrich. Michael Friend Production’s collaboration with Shaw’s Corner is now entering its 22nd year. The company, founded in 1992, tours the country and returns year on year to rapturous applause. Director and producer Michael Friend has built up a group of actors who understand and personify Shaw’s characters perfectly, bringing their passion and drive to life. Our rewiring project is well underway here at Shaw’s Corner, and we’ve started to find some interesting things under the carpets and floor boards dating right back to the earliest history of the house. May’s Object of the Month is this stunning portrait by Augustus John which hangs in the Dining Room here at Shaw’s Corner. Here is Shaw writing from Coole Park in Ireland to Frances Chesterton, storyteller and writer, and the wife of Shaw’s great friend G K Chesterton one hundred years ago today. I shall return to England next week. This is a lovely place; but one loses all disposition to work, and can hardly bear to wash oneself. I should have been back a week ago; but Lady Gregory insisted that Augustus John should paint a portrait of me. John exported himself for that purpose, but fell among convivial spirits and was lost on the way for a whole week. He arrived in a contrite and somewhat shattered condition on Sunday and has since painted and obliterated no less that three masterpieces. Like Penelope, he gets up early and undoes the work of the day before. But the sitter will strike presently: besides, my vanity rebels against being immortalized as an elderly caricature of myself. Lawrence, D H (Ed) (1985), Bernard Shaw Collected Letters 1911 – 1925, Max Reinhardt, London. John painted three portraits of Shaw over that weekend at Coole. Our version was exhibited by John at the New English Art Club summer show on 24th May 2015, and with the exception of a few further exhibitions celebrating Shaw’s life, it has hung at Shaw’s Corner ever since. The second portrait is now at the Fitzwilliam Museum in Cambridge, a gift from Shaw to his close friend Sydney Cockerill who was the curator there. It was through this version of the portrait that the Shaws met T E Lawrence who would become a very close friend. In March 1922, Lawrence accompanied Cockerill to the Shaws’ London home Adelphi Terrace to pick up the portrait, wanting to meet the great man. You can see the Fitzwilliam Museum catalogue entry for the painting here. The third version was owned by the Queen Mother and hangs to this day in Kensington Palace. In fact, if you look very carefully at this picture from The Telegraphy of Prince George’s christening you should be able to see it!